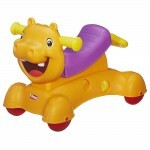 Toys R Us has Playskool Rock, Ride, n Stride Hippo on Sale for $11.99 with free store pickup. Talk about a toy that grows with you! This 3-in-1 hippo pal has 3 times the fun. It grows with your child and helps encourage baby to walk, rock, and then ride. He can hang on to the handle and walk, then it converts to a scooter he can sit on. When your child is ready to explore the house even more, it converts to a ride-on toy with a locking mechanism only grownups can activate. It encourages baby to gain balance and ride, then to coordinate those feet and walk! But it’s more than just a walker or ride-on — it’s an activity center, too, with 25 responses that include animal sounds, music, and silly sounds. With 4 motion-activated tunes, the motion controls the music – and the tempo! You might have a big, grown-up car, Mom, but baby’s the one with the really sweet ride! This toy also helps teach Balance and Coordination, Gross Motor Skills, and Cause and Effect. Includes body/chassis, head, rocker, seat, rear handle, 2 seat connectors, 4 wheels, bag of screws, 2 springs and instructions.